Wordless Books' is a growing genre where readers are able to express what they see in their own words, in their own language. Our story Props (kamishibai) range is growing since it is particularly suited for multi-lingual classes. This group, rather than individual, activity takes only pictures from familiar picture books and the group performs the story telling in their own words. 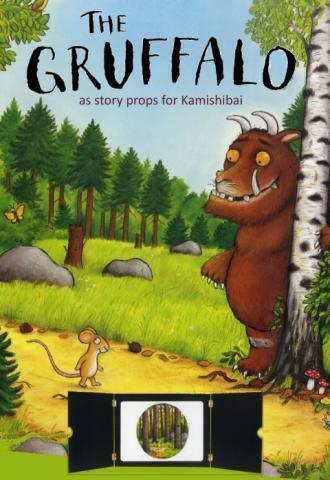 "The Gruffalo" by Julia Donalson, illustrated by Axel Scheffler, is one of the best known picture books this century, It is now available as 17 picture cards, with no text, for group story telling with the Kamishibai stage. One suggestion is that the teacher tells the story as it unfurls, card by card, in their own words. The audience are encouraged to participate and the teacher often pauses to ask questions. In multi-lingual classses pupils are encourage to speak in their home language if English is new to them. In fact, Gruffalo can be used as a tool to teach Modern Foreign Languages. The end effect is a dynamic story telling experience, with audience participation, which changes each time the story is retold! !